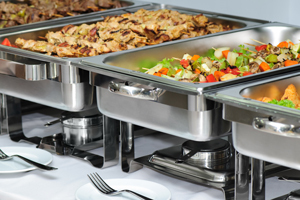 Anyone that has been a guest at an event has probably had an experience involving catering. The idea of catering in food seems fairly easy, but in reality there is a lot of effort needed to get the food to a guests table. After contact is made with a firm or business specializing in catering, the caterer will help determine your overall goal and how the caterer can help you achieve it. Have as much information prepared about your event as possible to ensure a smooth process. Once the caterer knows the type of event, date, time, guest count, venue and food ideas, the caterer can draw up a detailed proposal that includes menu items, staff requirements and necessary fees. The caterer also creates a digital overview of the venue to see how they can best utilize the space at your event. By doing the process this way the experience and work of the catering service is enhanced. In general, caterers like to have at least 3 hours to set up for the event. They also usually request a couple hours to breakdown after. A schedules acts as a script for the catering staff and are very detailed. Setup up time will most likely always be the biggest consideration before finalizing the schedule. On the day of the event, the caterer will load all necessary equipment with meticulous attention to detail, including plates and glassware, into a vehicle for transportation. The catering will generally be set up before any guests arrive. Once the event is over and the guests are satisfied, the catering team will repack every item they arrived with and prepare for the next catered event. If you are currently looking for a venue for your event, Stokely Event Center can make sure your special day is unforgettable. Guests to your reception will love the free-to-play games and wide assortment of decorative signs. With the flexibility of catering in outside food and drinks, event menus can fit a variety of preferences. The venue sound system, projector and screen are included for one great price to meet any audio/visual needs. If you are interested in reserving Stokely Event Center, please call us at 918-600-4448 or complete our online request form. We can’t wait to be part of your special day!